Cleveland erupting in June 2006, photographed by a passing astronaut. 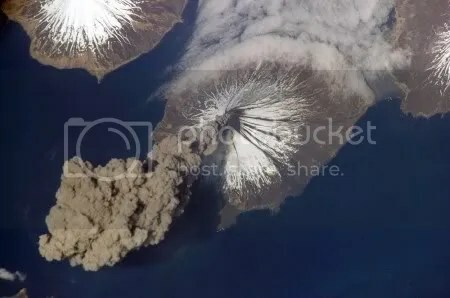 Satellite data indicate that Cleveland volcano erupted briefly this morning at ~0730 UTC (2330 AKDT) 02 October 2009, producing a small, detached ash cloud that drifted northeast of the volcano at maximum altitudes of 15,000′ to 20,000′ (4.5 – 6.1 km) . AVO increased the aviation color code to Orange, and the volcano alert level to Watch at 02:29 AKDT (10:29 UTC) this morning. Satellite views until about 6:45 AKDT (14:45 UTC) show that the ash cloud drifted northeast about 600 km (373 mi) and dispersed over the Bering Sea. While no more events have been detected this morning, further eruptive activity is possible. The volcano remains at Orange/Watch alert level status at the time of posting.